Announce the arrival of a new baby. 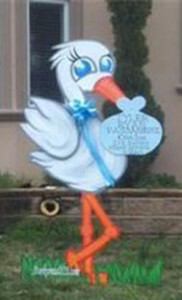 New moms dads, friends, neighbors and other family members also can order the Stork signs. They order our 7 foot wooden Stork yard display signs as a special surprise for Mom and Dad as they arrive home for the first time with their new baby. We place the Stork in a perfect spot in the front yard to welcome the new family member home. Schedule your Stork Rental in Queens Today! All of Stork Rental Signs are high quality wood and resistant to almost all weather conditions. Rain, snow, sleet, sun or wind should not have any affects on your Stork Rental. All of the Stork Rental artwork will withstand typical weather conditions. Installing the Stork Rental Sign on the new mother’s front lawn will only take us about 5 minutes, so we can time the Stork to be a surprise! 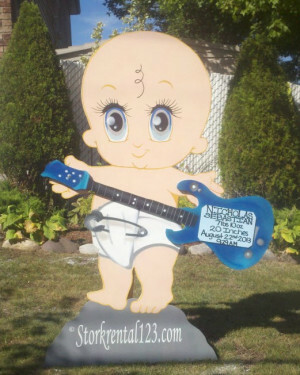 Stork Rental Signs are 7 feet in height and customized for your baby’s delivery information. You can extend your Stork Rental, ask about special offers! Stork Rental 123 also offers birthday and welcome home military sign rentals, call for details. Surprise the new mom in your family when she comes home from the hospital! Renting a stork is simple and as easy as 1-2-3! You provide the baby’s information and we do the rest. Stork 123 will deliver, install, and pick up the stork and you get to keep the custom bundle hanger! Stork Rentals 123 provides new parents and family members with a special way to announce the arrival of a new addition to the family.